A chronicle of a real-life bus hijacking in Rio de Janeiro that occurred on June 12, 2000. Stars: Michel Gomes, Cris Vianna, Marcello Melo Jr.
An unforgettable tale of friendship and survival in a city where the greatest challenge is growing up. Q: What is a "favela"? Q: Is this a sequel to "City of God"? Q: Any recommendations for Brazilian movies similar to "Cidade dos Homens"? "City of Men" is a companion piece to Fernando Meirelles' 2002 film "City of God," but it's a much different animal from the earlier film. Both are set in the slums of Rio de Janeiro, and both are about young men fashioning lives for themselves out of the only resources available to them. 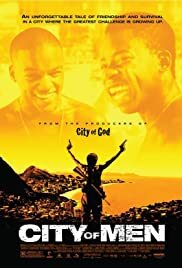 But whereas "City of God" was kinetic, angry and immediate, "City of Men" is more reflective and conventional, and it comes to a much more hopeful conclusion than the earlier film. "City of Men" is by far the weaker of the two. The carefully crafted screenplay was full of the heavy themes and plot twists of a Shakesperean tragedy, but I found myself missing the unscripted, documentary-like feel of Meirelles' film. "City of Men" is about the absence of fathers, and about two friends who find themselves fighting on opposite sides because of deeds committed by their own dads -- sons literally inheriting the sins of their fathers. But the script is too often heavy handed, and the director, Paulo Morelli, chooses to communicate too much about the lives of these people through blunt exposition. We don't learn about them from what the actors playing them do or how they act, but rather through the lines they read, and we're almost always aware that they're reading lines. Nevertheless, the acting is strong enough that I found myself caring for the two leads and fairly engrossed in how their stories turned out. Morelli isn't as accomplished a director as Meirelles, but the film is still well directed on its own more modest terms. If I didn't already have "City of God" to compare it to, I might have liked it even more.